UPDATED: Thu., Feb. 22, 2018, 6:55 a.m.
OLYMPIA – Facing a judge’s ruling that they’re violating the state Public Records Act, lawmakers will use special rules Thursday to begin pushing through a change to the law that would allow them to continue hiding many of their records and set a process to release others. The bill, which would make the exemption to the law retroactive, argues the Legislature is a separate branch of government and can make its own rules “to preserve the independent deliberation of the people’s representatives” while setting up access to some records. Last month, Thurston County Superior Court Judge Chris Lanese ruled the system the Legislature has used for years to respond to public records request does not meet state law. Lawmakers were referring requests for records to the secretary of the Senate or clerk of the House, which routinely rejected those requests. Individual legislator’s offices are state agencies under the Public Records Act, Lanese said, and as such must respond to requests and make many of their records public. Lanese was ruling on a summary judgment in a case brought by the Associated Press and news organizations around the state, including The Spokesman-Review. A later legal brief by the state attorney general’s office agreed with Lanese’s ruling. Lawmakers have said they would appeal, but in the meantime legislative offices have received numerous public records requests. No decision has been made yet whether the Legislature would drop its appeal of Lanese’s ruling if the bill passes. “We are looking at the cost to taxpayers,” Nelson said. To date, the Legislature has spent more than $125,000 on private attorneys to defend against the public records lawsuit brought by the news organizations. Since the judge’s ruling, people have demanded records from individual legislators’ offices and there are no procedures for reviewing and releasing them, she said. 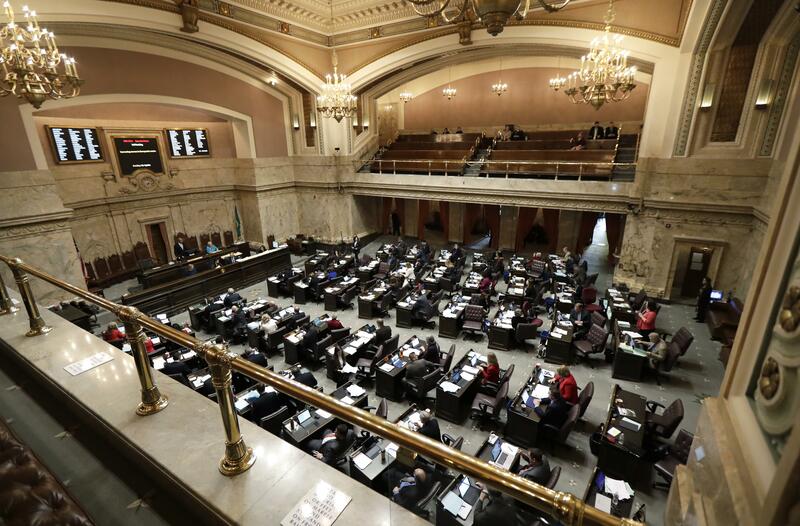 Nelson and Senate Minority Leader Mark Schoesler, R-Ritzville, are the sponsors of the bill, which was made public at 3 p.m. Wednesday in advance of a special joint work session at noon Thursday for the Senate and House committees that have jurisdiction over state government. At a news conference earlier in the day, Gov. Jay Inslee said he hadn’t seen the bill, but thought the Legislature should be as open as his office, which routinely releases documents it could withhold. Although billed as a work session, at which public testimony is not normally allowed, Nelson said the public will be able to testify at Thursday’s joint meeting of the State Government committees. They will not vote on the bill; instead it will be moved to the Senate floor for a possible vote on a rarely used procedure. The bill would allow lawmakers to keep the public from seeing many of the records that come into their individual offices. It would also make the exemption retroactive, meaning any prior record not considered releasable under the new law would not have to be disclosed, despite Lanese’s ruling. Under standard legislative rules, a bill that changes a state policy would have to receive a hearing in a House or Senate committee that has jurisdiction over the proposed policy change much earlier in the session. It would be required to be voted out of that committee by Feb. 2, and if it has an impact on the budget, as this bill does, it would need a second hearing in the Senate Ways and Means Committee and a second committee vote by Feb. 6 to be sent to the full Senate. It would have had to pass the Senate by Feb. 14, be sent to the House and go through another set of hearings, and be out of the House policy committee by Friday. This bill, however, will be moved to the Senate floor later this week without a hearing by the special procedure that allows lawmakers to avoid those standard deadlines for bills that are part of the budget. Nelson said the special procedure was necessary because time is running out in the short 60-day session. Legislators have had six attorneys working on the language in the bill, and just finished this week. It is not unusual for policies that are part of the budget to be introduced after the standard deadlines and put to a vote in the final days of a session, she said. Lawmakers will have to add some $350,000 over the next four years to create and staff an office to handle public records requests that the Legislature will comply with. Published: Feb. 22, 2018, midnight Updated: Feb. 22, 2018, 6:55 a.m.